I am a dance and theatre artist and mental health campaigner. I do lots of different things. I make work that seeks to creatively express difficult mental health narratives. I describe my work as auto-ethnographic rather than autobiographical in that I want to use my own story and experiences to draw out universal themes and broad political concerns. I campaign for access and inclusion for artists, audiences and participants with mental health needs in the arts. I do this by mentoring artists with lived experience, working with organisations to develop inclusive programmes and practices, writing articles/blogs and speaking at events. I also artistically direct a community dance micro-organisation and lead participatory performance work with adults with mental health needs. I have always danced in one way or another but my background is very unconventional for a professional artist. My degree and masters are in Social Policy. I left my PhD to be a road protester and traveller. I found my way into professional practice by doing foundation training in Dance Movement Therapy at Dance Voice, Bristol. After that I founded Mean Feet Dance to bring creative therapeutic dance opportunities to communities in Somerset. My own artistic practice was never on the agenda. My mental health condition has been a barrier – a combination of my own challenges, low self esteem and disabling environments did not make it possible for me to engage. With some determined nudging from helpful mentors, a great deal of support and my own political drive to address exclusion through my own practice – I finally feel able to make and tour the work I want to share. MasterShit is a study of success, perfectionism, shame, sugar addiction, dental health and mental health. It will be a small scale touring comedy dance theatre show with 3 performers. At PDSW, I want to experiment with movement material exploring derealisation and dissociation – both physical aspects of my mental health condition – involving a sense of unreality and disconnection in the body. Restless is a large scale choreographic research and arts activism project which involves walking the 630 mile SW coast path, engaging creatively with communities of survivors of the mental health system, childhood abuse and domestic violence and making a new dance work in response. While at PDSW, I want to investigate approaches to body dialoguing to create choreographic scores which unearth an authentic physical language to voice trauma narratives through a process of re-embodiment. This work connects viscerally with coastal landscape and considers cycles of renewal and cleansing. Dancers often say they “have to” dance and for me that is certainly true. My mental health condition is a dissociative disorder so for me it is vital to stay embodied and dance is the best way for me to do this. My body has stories it wants to tell, and things it wants me to understand. My creative practice is about listening to my body and allowing its truth to come through – however difficult that is. I see my work as political and subversive and I locate myself within an arts activism approach. Mental health, abuse and violence are still surrounded by stigma, silence and shame and there is an urgent cultural imperative for this to change. My work is about voicing experiences that need to be heard, seeking connection with others that share similar journeys and undermining the systems that perpetuate abuse and violence. The short answer is I work very carefully. Because my work explores challenging territory I spend a lot of time thinking about how to do that well. I am developing mental health friendly making and touring processes that enable me and support my wellbeing. I am a big fan of the slow burn, giving work time to incubate and develop over time with lots of space for reflection, support and the honing of content. My producers at Strike a Light Festival have really come with me on this exploration of processes that fit my needs and result in honest and courageous work. I lack formal training so I am lucky to be able to work with some really high calibre collaborators including Tom Roden, Chris Fogg, Mandy Braden and Tom Johnson. In terms of creative process it’s all quite hard to explain. Anything that makes it to the stage is likely to have its origins in my living room many years previously. My body wants to move, wants me to listen to it which I have done over a long period of time and mainly in private. This process is something I want to attempt with the Restless project in a more shared environment. When it came to making I am Joan I arrived in the studio with lots of raw ideas and like a rabbit in the headlights. Very slowly and initially quite arduously, we found ways of creating a safe working environment together. 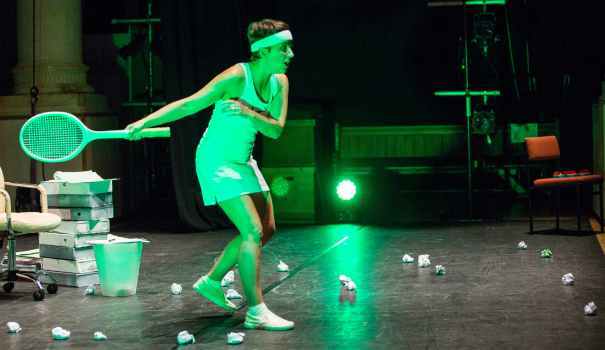 We drew on mental health research, improvisation/devising techniques, contemporary, aerobics and bad tap dancing and references to popular culture to start to piece together a physical language for the show. In PreScribed (a life written for me) I was interested in how to show the conflict between the character’s external professional persona and her inner chaos – I contrasted bound movements with falling and recovering and a sense of push and pull. I found a motif of her tugging on her top as a way of “pulling herself together” which a lot of GP’s in the audience commented on having resonated strongly. I am fascinated by how our bodies speak a language we all understand – how dance can reveal this and communicate something very specific, very succinctly. I have no interest at all in making abstract work that can be read in different ways. I want to tell important stories that need to be heard and understood and unambiguous. I find myself relying on text to make sure everything is clear but I am finding that audiences understand so much from the moving body. The most important responses I have are from people with lived experience of mental health. If my work resonates and gives voice to something that is difficult to express, I see that as the best possible outcome. If it can enable people to speak up verbally or creatively, that is the icing on the cake.